Submitted by Taps Coogan on the 8th of April 2019 to The Sounding Line. 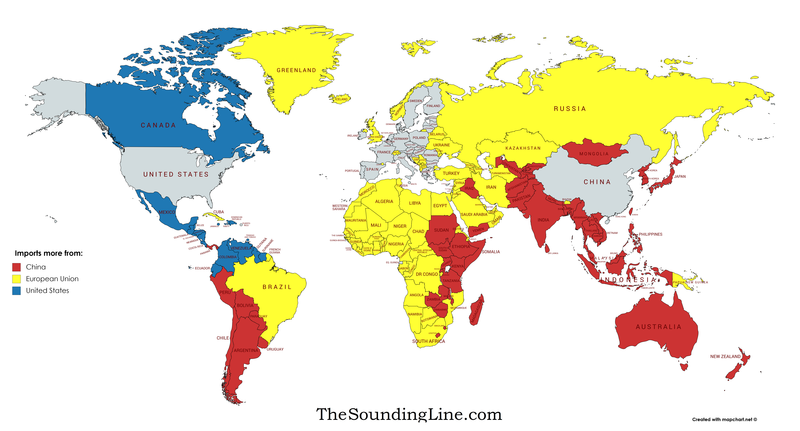 We recently created a map that shows whether every country in the world imports more from China, the US, or Germany. We chose those three countries because they are by far the largest exporters in the world, with the next largest exporter, Japan, exporting less than half of Germany or the US, and less than a third of China. Today we share the same map, but in place of Germany we look at the entire EU. Combined, the EU is the world’s second largest exporter and is responsible for roughly 15% of global exports, compared to 17% for China and 12% for the US. Complete data on EU wide exports by country is surprisingly scarce. So, to create this map we summed the World Bank import data for each country in the world from every EU member. We excluded the UK under the assumption that it will leave the EU, though that is looking less likely everyday. 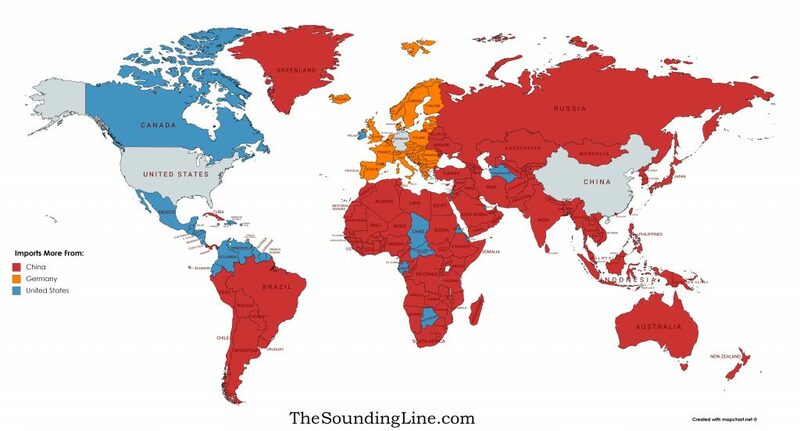 To be clear, this map does not show the largest import source for any given country, simply whether it imports more from China, the EU, or the US. Replacing Germany with the entire EU makes a huge difference compared to the previous map (shown at the end of the article). The EU is the larger of the three exporters to most of Africa, every European country outside the EU, and most of the Middle East and Central Asia. China is the top exporter in most of Eastern Africa, East and South Asia, Australia and New Zealand, and parts of South America. The US is the top exporter to relatively few countries, all of which can be found in North America, the Caribbean (not shown), and parts of northern South America. While not shown on the map to avoid confusion, the US imports more from China than the EU, China imports more from the EU than the US, and every country in the EU imports more from China than the US except: Ireland, Belgium, Luxembourg, and Malta.